Tombstoning (also known as the Manhattan effect, drawbridge effect, or Stonehenge effect) is described (in the simplest, and most common, sense) as occurring when one end of a passive device, such as a resistor or capacitor, rises up out of the solder and breaks contact with the circuit. But it is not limited to passive devices. 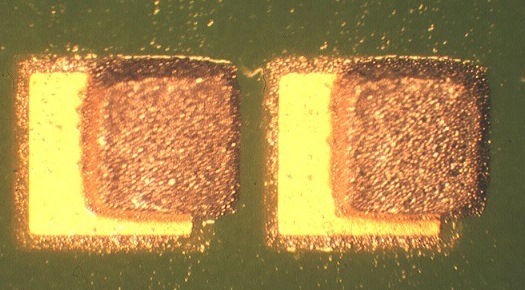 Other surface mount devices can tombstone as well (see the tombstoning diode image - top). Tombstoning is a "fatal" defect because it produces an open circuit. Tombstoning is almost always the result of uneven wetting forces on the terminations of the component. When one end "wets" before the other, the (now unbalanced) wetting force of the solder "pulls" the component, rotating it, causing it to stand on end. Various factors contribute to tombstoning. The one that we (as a solder paste supplier) typically encounter is uneven heating of the PCB assembly - which causes one paste deposit to melt and wet before the other - per component (as described above). Trying to achieve a higher reflow temperature, as required with the new mainstream Pb-Free alloys, can exacerbate the greater thermal gradient across the PCB (and from one end of a component to the other). The reflow oven operator can slow down the ramp rate. 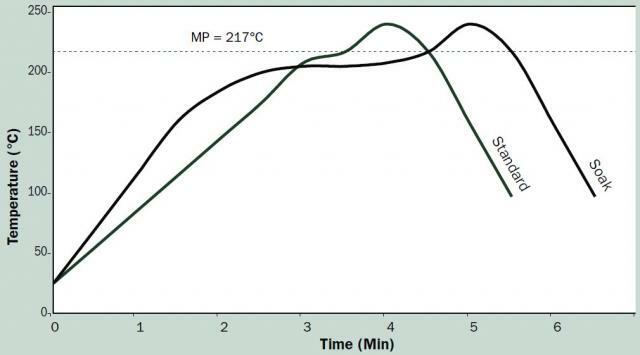 A slower ramp rate allows for more uniform warming of the PCBA. Another technique is to employ a "soak" just below the melting temperature (solidus) of the alloy. For example, for a SAC305 profile (217°C solidus), one may implement a "soak" at 205 to 210°C for 30 to 120 seconds. This allows for the cooler parts of the PCBA to "catch up" to the warmer parts. After thermal equilibrium has been achieved, one can spike the temperature up to the appropriate peak temperature (i.e. 245°C). 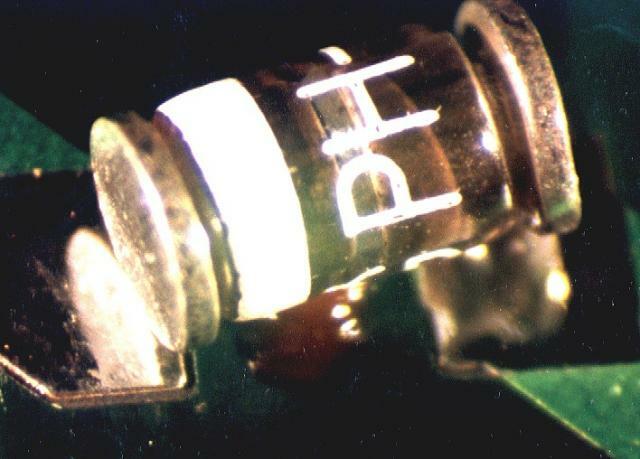 This technique (depicted in the reflow profile shown at the right) allows for all of the solder paste deposits to melt and wet the component terminations at roughly the same time; thereby, mitigating tombstoning. Different flux chemistries, and types, can also impact tombstoning. It is often desirable to have a solder paste that wets well, even to old, oxidized components. One possible negative side effect of an excellent wetting solder paste is tombstoning. When the paste wets "aggressively" to the component terminations, causing a strong wetting force, even the slightest disparity (temperature, cleanliness, flux area, etc.) from one termination or pad to the other can cause the component to tombstone. The wetting speed and force is also directly related to the rate at which the solder melts. It should be obvious that wetting only occurs when the solder is in a liquid state, not while solid. For this reason, solder alloys that are not eutectic (alloys that start to melt at one temperature but are not fully liquid until some higher temperature) can produce less tombstoning than a eutectic (clearly defined melting point) alloy, all other things being equal. Sn63 (63Sn 37Pb) is a eutectic alloy and makes a clean transition from a solid to a liquid at 183°C. Sn60 (60Sn 40Pb) is not eutectic and starts to melt at 183°C but is not fully liquid until 191°C. In the case of "non-eutectic" alloy like Sn60, between 183°C and 191°C, solid and liquid are coexisting. To this end, some solder paste manufacturers have developed alloys that melt gradually (are purposely not eutectic) to combat tombstoning. The pad design and lay-out can also affect tombstoning. Usually pads that are located mostly beyond the terminations or have large pad areas beyond the terminations can contribute to tombstoning. 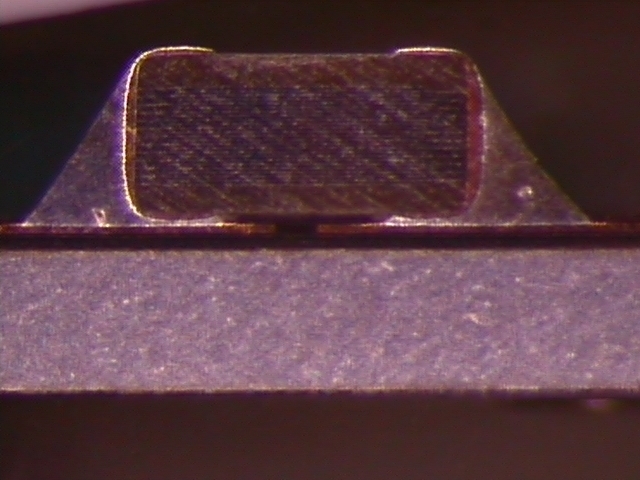 To the left is an image of a cross section of a soldered passive component. Notice how the solder fillet reaches to the top of the termination. Solder paste deposits that extend well beyond the component cause a lot of wetting force and leverage to be applied to the extreme ends and tops of the component. This wetting force, if not evenly applied to both terminations, can cause the component to tombstone. Similar to the placement of the solder paste deposit (pad design), solder volume can also impact tombstoning. It is very simple. More solder equates to more wetting force and vice versa. To the right is an image that has an extremely reduced amount of paste volume (not recommended to this degree). If one could imagine that this component had indeed properly soldered to the pads, one could see how it would be nearly impossible for the component to tombstone. There is simply not enough solder to wet the entire end of the termination. Solder deposit volumes that restrict the solder from being able to wet up to the top of the component greatly reduce the wetting force and leverage that the solder can apply to the component. Depending on the class of workmanship that one is building to, it may not be practical to reduce the solder volume. The product class may require fully wetted terminations. It is also critical that the solder paste deposit and component sit squarely on the pads. Any offset can affect the way the solder wets the terminations and can cause tombstoning. Miniaturization, as characterized by smaller, lighter passive components, such as 0201s and 01005s, creates a struggle where tombstoning is concerned. 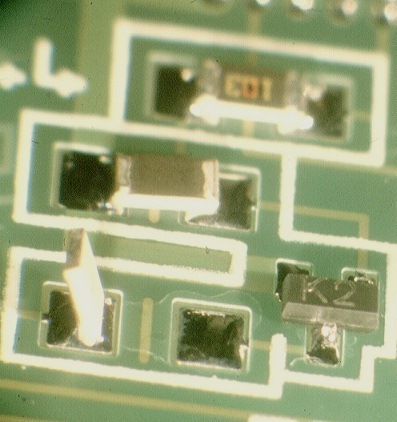 Issues of solder paste deposit location (see image to the right), component placement, and solder paste volume are difficult to control given the overall minuscule scale of the scenario. Also, smaller components are inherently lighter and, therefore, easier to pull up on end. Controlling tombstoning is a critical issue in SMT assembly. But, with understanding what causes tombstoning, one can control it.